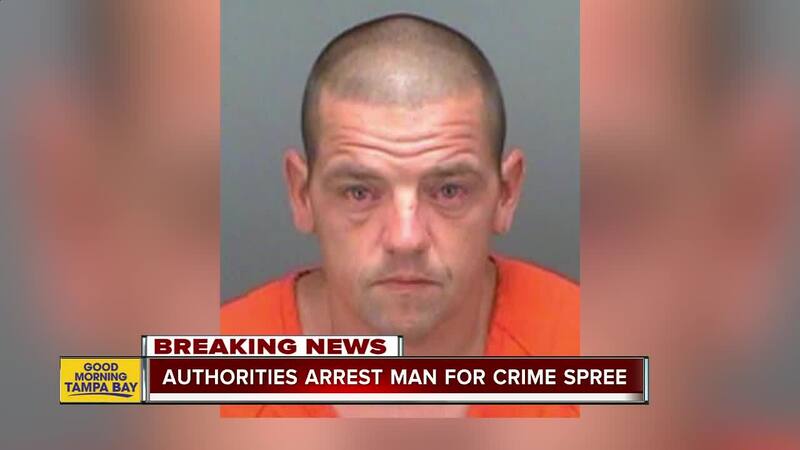 CLEARWATER, Fla. — A 36-year-old man has been arrested after a crime spree started at a car dealership and ended at a Clearwater bank. In between the start and end of the crime spree were at least two car crashes, four attempted vehicle thefts and three home burglaries, according to the Pinellas County Sheriff's Office. Shanon K. Dubois, 36, was eventually arrested without incident at the Florida Central Credit Union on NE Coachman Road in Clearwater, just over a mile from where his alleged crime spree began. He's being charged with a whopping 18 felony charges for his actions on Thursday. Investigators said it all started when Dubois stole a 2016 Dodge Ram truck from the Dayton Andrews car dealership on Gulf to Bay Boulevard in Clearwater. 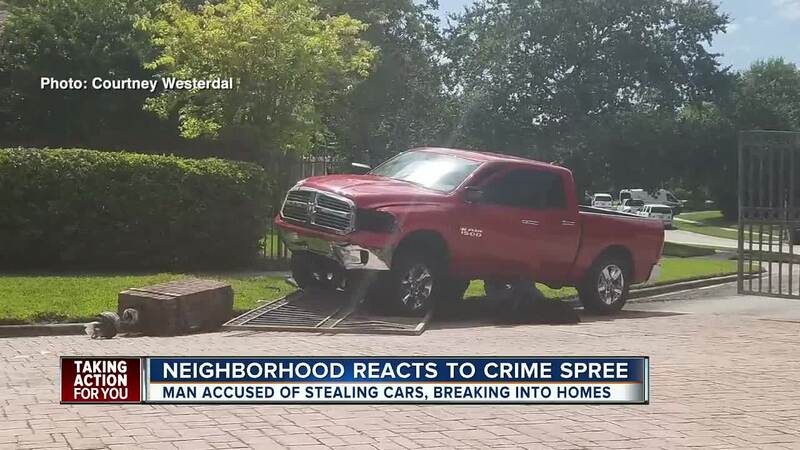 He soon crashed the truck at the intersection of Gulf to Bay Boulevard and NE Coachman Road, but then continued to drive to the Coachman Hill Preserve neighborhood where he drove the Dodge truck into the gated community and crashed into two residential mailboxes before crashing into the security gate. “I see a man just casually walk down the street like it was nothing (then he went) into my neighbor’s house,” resident Jake Kugler said. At that point, deputies said Dubois ran off and broke into two homes along the 2200 block of McKenzie Court. While in one of the homes, Dubois grabbed the homeowner's nanny by the wrist and chased her into the home. Dubois then went into the garage and unsuccessfully tried to steal a 2015 BMW. Dubois instead stole a 2012 Kawasaki motorcycle in a different home and drove away towards NE Coachman Road again. Deputies said Dubois then drove to a residence located at on Sharkey Road where he abandoned the motorcycle and burglarized an occupied residence. The victim at the residence confronted Dubois and Dubois left the home. According to deputies, Dubois then burglarized a vehicle on North Terrace Drive and attacked the owner of the same vehicle. Next, Dubois tried to burglarize a truck. When that attempt failed, he tried to steal a semi-truck at Tommy's Produce located at 410 Belcher Road, Clearwater. Deputies were responding to the area when they were informed Dubois was last seen near the Florida Central Credit Union located at 2201 NE Coachman Road. Deputies located Dubois at the bank and took him into custody without incident. Numerous witnesses positively identified Dubois. When Dubois was arrested, deputies also found Hydrocodone and Alprazolam in his possession. Deputies transported Dubois to the Pinellas County Jail. Dubois was charged with two counts of Grand Theft Motor Vehicle, one count of Attempted Grand Theft Motor Vehicle, three counts of Burglary to a Conveyance, two counts of Burglary to an Occupied Dwelling, three counts of Leaving the Scene of a Crash with Property Damage, one count of Burglary/Battery, one count of Battery, two counts of Possession of a Controlled Substance, and three felony warrants for Violation of Probation- Grand Theft Motor Vehicle.